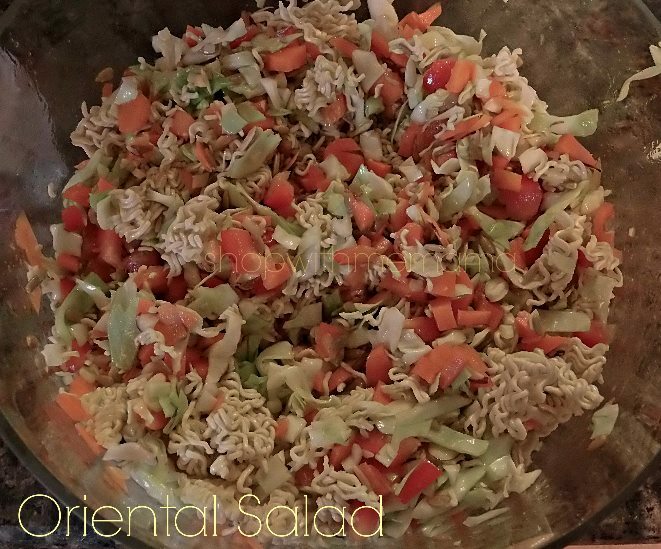 The Oriental Salad With Ramen Noodles has ALWAYS been a huge hit and a big favorite of mine. My mom would always make it for big dinners and I could not eat just one serving. It is truly delicious! Not only is it delicious, it is EASY to make too! My kind of side dish! If you like sweet, crunchy salads, then this dish is for you! A delicious and easy to make side dish everyone will love! In separate bowl combine oil, rice vinegar, white sugar and sunflower seeds, mix well. Have you ever made this salad before? I love oriental salad with ramen noodles, but I’ve never known how to make it. Thanks for the recipe! I’ve never had an oriental salad before but it looks great. I never would have thought of this – delicious! Yum! I’ve never had anything like this before! I bet my kids will LOVE it! That looks delicious! I love oriental salads.